DEATH stands at the hospital bedside, waiting. Beneath the covers, a gasping youngster rights for breath. He is a’victim of infantile paralysis. Slowly, cruelly, the dreadful fingers of paralysis clutch at the chest muscles which pump the breath of life through his body. Soon those muscles will cease to function and the youngster will cease to breathe. But death has not reckoned with the mechanical ingenuity of man. A watchful doctor nods to a waiting group of hospital attendants. The youngster is wheeled into an adjoining room, brought to rest alongside a strange object which looks like a torture chamber out of Poe. It is a horizontal metal cylinder, large enough to hold a man, with glass windows in its sides and weird dials projecting from it. Gently, the patient is placed inside. Only his head projects from one end. It rests on a pillow and a soft collar fits snugly about his throat so that his body rests in an airtight chamber. He is a prisoner, buried alive, but buried only that he may live. The cylinder is a diaphragm respiratorâ€”commonly known as an “iron lung”â€”which will literally do the patient’s breathing for him, maintaining the spark of life. A switch is thrown, dials checked. A motor hums to life beneath the respirator. A miracle is taking place inside the tank. Life-giving air surges into the patient’s lungs, is robbed of its oxygen and exhaled. The rhythm of breathing is perfect, except that the patient’s own nerves and muscles have nothing to do with it. For hours and days the iron lung keeps the breath of life in the body of its guest. It is a wonderful mechanism of nature which the iron lung replaces. It is only when you run for a train or have a cold that you realize you are breathing at all. The principal muscle of respiration is the diaphragm, and an extraordinary muscle it is. If you lift your hand, the action is accomplished by voluntary muscles obeying your command. The heart is a muscle, too, but different in functionâ€”you cannot stop or regulate its beating; it is completely involuntary. But the diaphragm is both voluntary and involuntary. You can stop its action temporarily â€””holding your breath,” you call it Possibly you can hold it long enough to become unconsciousâ€”and then the annoyed diaphragm goes back to work in spite of you. That is why you cannot commit suicide by holding your breath. The lungs themselves do none of the work of breathing. No one really inflates his lungs. What you do is to distend the chest cavity or thorax, and air rushes in to fill the lungs, obeying the age-old principle that nature abhors a vacuum. Occasionally something happens to the diaphragm and its related muscles and nerves. Then the patient is quite unable to breathe, and death is inevitable unless artificial aid is at hand. Infantile paralysis is the most common cause of such respiratory trouble. Fortunately, not all cases of infantile affect the respiratory system. Legs and arms are more common objects of attack, as was the case when Franklin D. Roosevelt suffered the disease in 1921. So complex are the organs of breathing that it would seem almost impossible for mechanical ingenuity to create a machine which will aid their work. Yet in principle the iron lung is extremely simple. Imagine that your lungs are a toy balloon contained in an airtight box. The neck of the balloon is a sort of throat which leads to the outside air through an opening in one side of the box. Now imagine that you connect a tire pump to a valve in the box. You pump air into the box and it forces the balloon to collapse; you pump air out of the box and the balloon expands to fill the vacuum, drawing in outside air through its throat. That is the principle of the iron lung. Essentially, it is an airtight chamber for housing the chest of a patient. A partial vacuum is produced inside the chamberâ€”the patient’s chest wall expands and air rushes in through the trachea to fill his lungs. Then, for the vacuum, a slight pressure is substituted, and the flexible chest relaxes and air is exhaled from the lungs. This cycle, repeated endlessly in the normal rhythm of breathing, is the mechanical achievement of the iron lung. The most commonly used factory-built diaphragm respirator is of the Drinker or Emerson type. A late model looks very much like a small edition of a creamery churn. The patient’s body lies inside the chamber on a bed which can be rotated from side to side to change his position for greater comfort. Openings in the sides are provided for nursing care. Once the patient enters an iron lung he does not come out until he is well or his case ends fatally. 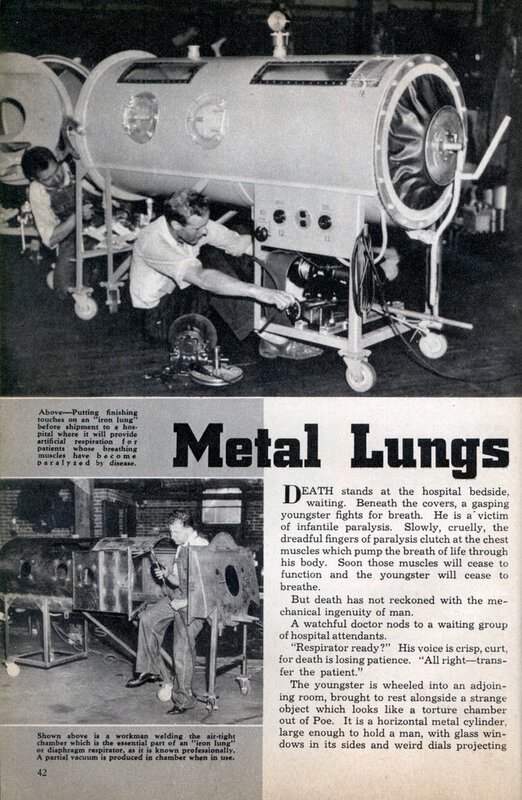 The iron lung is, in a very real sense, the patient’s own diaphragm and he would quickly die without it. 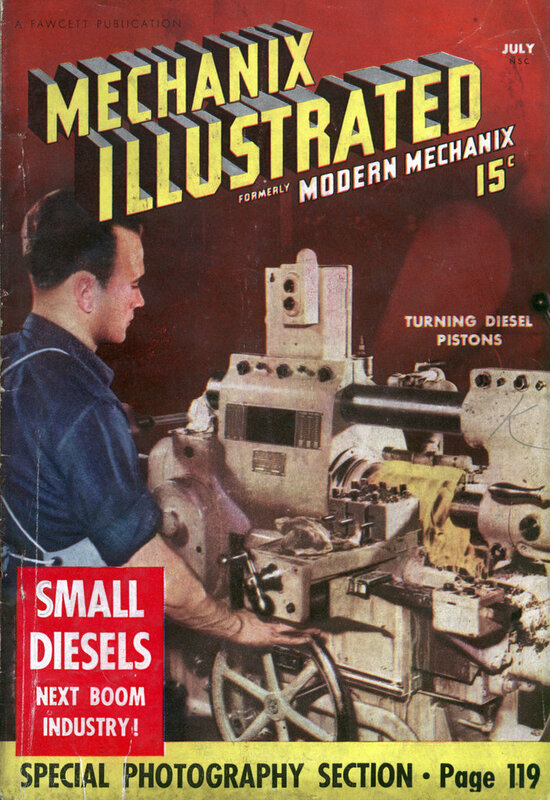 The cumbersome nature of the iron lung has led many workers to experiment with smaller models. Not long ago newspapers were filled with the dramatic story of the plucky fight being waged against infantile paralysis by Fred Snite, Jr. Stricken with the disease in China, he has lived in an iron lung for nearly two years; he made the return trip across the Pacific to his father’s home in Miami encased in his metal prison. In time his arms and legs, lying inert inside the chamber with its partial vacuum, would atrophy. To release young Snite from his life-saving prison, Dennis R. Scanlan has developed a smaller respirator based on principles first worked out by Dr. Bo Sahlin, assistant professor at the Physiological Institute, Lund, Sweden. It is more properly described as an aluminum and rubber lung rather than an iron lung and it was developed with the cooperation of William O’Neil and his company, the General Tire & Rubber Co., of Akron, Ohio. Herman Kraft, research expert of that company, cooperated in working out the design, which covers only the chest and abdomen of the patient and resembles the mouth of a gigantic vacuum cleaner. This is a great invention but are we doing this for the patient or are we doing this for the family of the patient. Living inside an iron lung doesnt seem to be a way of life. If it is for a temporary fix I can see it. I guess it should just be up to the patient.